We head back to Caernarfon this September 8th! WHEN the first Arfon Real Ale Trail took place earlier this year, we were massively surprised at how successful it was. We like to think that the Ale Trail is a good idea but we’re stoked to find so many other people just as enthusiastic as we are about it. There is a few changes this trail compared to the last Trail, we are taking in eight pubs – stop-offs include a few major town Caernarfon, Bethesda, Y Felinheli and Carneddi – the Trail gives the ale officinados the opportunity to sample some tasty Welsh ales without having to worry who’s going to do the driving. No Designated Drivers needed here a ticket covers your travel. Ale Trail buses pick up and drop off at each of the pubs on the trail every half an hour, so Pappas and mommas looking for a fun day out with their friends after a busy week at work can enjoy a pint or two without worrying about driving home. Caernarfon Real Ale Trail returns after it’s first sell-out event in April to the delight of real ale enthusiasts. With up to 50 Real Ales to try, some exclusive to the pubs and the area! 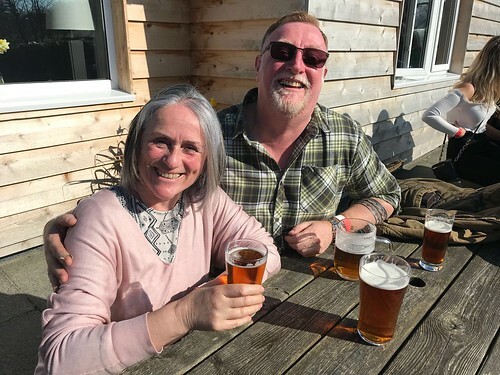 Snowdonia Parc landlady Carmen brews up to 10 exclusively for her pub and local microbreweries such as Purple Moose, Cwrw Llyn, Bragdy Lleu and the Trail’s Cwrw Ogwen can be found at the bars of these hand-picked pubs. “Fantastic day with a lovely atmosphere in each venue. All the buses arrived on time and overall seemed to be very well organised. Will be attending again!” say Donna after attending April’s Trail. With buses arriving every 30 minutes at each venue between 11am and 11pm, so you can start and finish anywhere on route. It gives you the freedom to meet up with friends along the way, spend as little or a long in one pub. From experience, we find choosing a few venues you’d like to visit it better than try and go to all off them. What caught us out a little with our first event was how popular the idea was in Bangor. Despite the trail starting from Caernarfon, large numbers of ale-loving Bangorians still managed to book themselves on and have an amazing day out, sampling some tasty Welsh beer and generally having a splendid time. So for our second event, we thought it would be nice to help out our friends in Bangor by sorting out shuttle buses from Bangor itself to the start of the Trail. 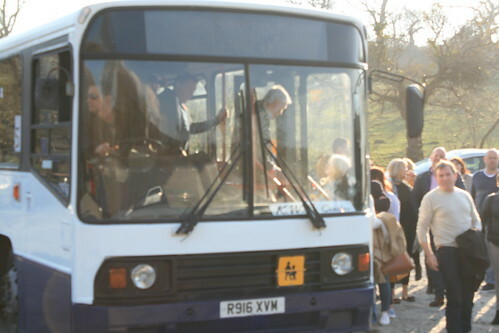 Naturally, that shuttle bus is free with your £15 Ale Trail ticket but booking is essential as places are limited. The afternoon pick-up (from Bangor Railway Station at 12pm or 12:30pm) delivers you to the Tafarn y Fic in Y Felinheli and the evening pick-up (at 8pm and 8:30pm) takes you back home again from Y Sior in Caernarfon, dropping back in Bangor. In between, there’s no need to try to get to every pub – in fact, we would advise you not to – but we would recommend making the most of the fantastic food, incredible scenery and legendary hospitality which makes North Wales the natural home of the Real Ale Trail. Click here to book your seat on the Bangor! The participating pubs are chosen for their hospitality, atmosphere and course cracking selection of local Ales! NEW to the Trail – The Newborough Arms famous for being the set for one of the most successful Welsh-language comedies, Cmon Midfild, about a village football team committee as well as it range of Ales and huge beer garden. Cwrw Ogwen first Tap Takeover! Bethesda based microbrewery – Cwrw Ogwen is taking over the taps at The Victoria Hotel on the Trail this September. Showcasing their three Real Ales – Caradog, Chwalfa and NEW ale Tryfan, named after a mountain in the Ogwen Valley, which part of the Snowdonia mountain range. Sounds good, right? So how do you get a seat on this special beer festival, tickets are £15 in advance and £18 on the day, so save yourself a pint and get your ticket from any participating pub or online here to collect on the day in your chosen pub. Tickets gets you unlimited bus travel between 11 and 11 on the 8th September. Wirral Real Ale Trail 8th September 2018	| NEW Vale of Glamorgan route revealed!